We, the crew of Soyuz MS 09, arrived safely on the ISS, started our research – and it feels fantastic to be back up here! 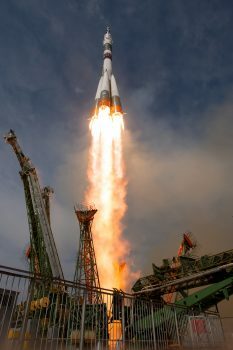 The launch with the Soyuz rocket was bombastic, but relatively relaxed nonetheless. What sounds like a contradiction has a very simple reason: because this time, I knew what to expect. The atmosphere on board was fantastic, thanks to my crew mates Sergey and Serena. This showed, for example, as we sat in the narrow cockpit, waiting for pressure tests to be conducted ahead of our flight. Earlier, each crew member had been given the chance to request a few pieces of music to be played over the radio during the pressure tests. Serena’s list included Michael Jackson’s “Billy Jean”, and when it was played, we all started dancing with our hands for fun. We thought we were unobserved, but at that very moment, mission control turned on our cockpit camera! I’m sure that caused a few spontaneous laughs in the control centre, not to mention all the viewers watching the live stream. The show was not planned, but it does illustrate an important point in our profession: one should always retain a sense of humour. There are enough serious moments. 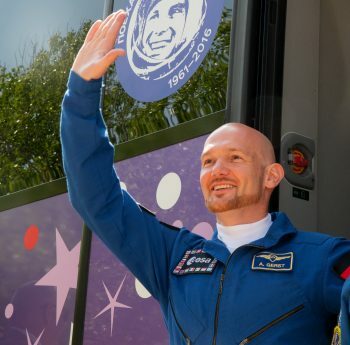 ESA astronaut Alexander Alexander waves farewell to family and friends as he departs the Cosmonaut Hotel to suit-up for the Soyuz launch. Credits: ESA–S. Corvaja. Things also went almost too smoothly during our flight to the space station. Unlike in training, there was not a single moment during the real flight when Sergey and I had to test our limits as pilots and co-pilots. What is absolutely desirable, of course, appeared unusually quiet to us. Unlike the first mission, I had completed the full training programme to be able to control the Soyuz myself. And that was a great feeling: knowing that I really have this under control. I could fly a spaceship with my own hands if necessary, and not just in the simulator. Even in automatic mode you have to control the spaceship with countless inputs on the console. However, compared to the simulator, in the real spaceship you typically always check two or three times whether you are actually entering the right commands. Pressing just two wrong buttons would be enough to blow the spaceship in three parts or depressurize it immediately, without an “are you really sure?”. This sounds dangerous, and it is, but in some situations, such as an emergency re-entry or fire, we have to do just that in a flash to save the life of the crew. By the way, our training under a steady bombardment of malfunctions was not completely useless. During our approach to the ISS, shortly before a thrust maneuver, an alarm signal indicated that one of our engines had failed. However, thanks to the safe design of the Soyuz capsule, this was no problem: we simply switched over to the spare engine for the next thrust. And, in the end, it actually turned out that our thrusters were all fine, only a sensor had triggered incorrectly. It is in these moments when our training really pays off. You have to be constantly alert, constantly acting, even if the spaceship often flies automatically. The most experienced cosmonauts rightly say you have to “fly ahead” of the spaceship in your mind, ready to manually take over at any moment. The two days of living in the tiny Soyuz were long, but contrary to my expectations I slept relatively well. Once I slept for eight hours and in the next “night” I slept almost eleven hours – what a luxury compared to the previous months. And luckily, like on my first mission, I didn’t get sick, even though the capsule is in a spin during most of the approach to . After these two rather calm days I was completely relaxed when we arrived on ISS, having had the time to eat, go to the toilet and get used to life in space. I still don’t know exactly why, but my body appears to have been created specifically for such strange environments. Just as I always felt very comfortable under water as a child, in free fall while skydiving, or in the cold of Antarctica, for some strange reason it feels completely natural for me to float around here in space. 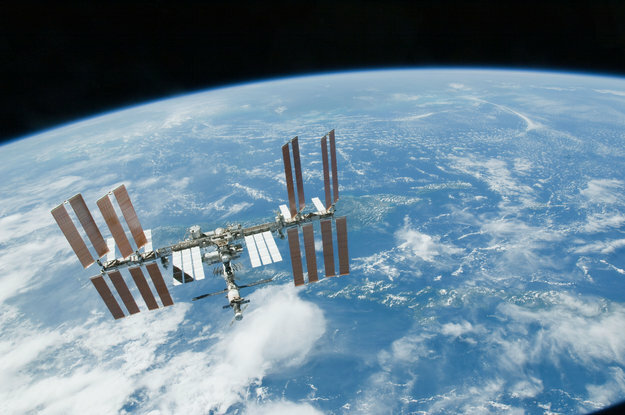 During my first mission, the biggest challenge of my first few weeks was re-familiarising myself with the many complex computer systems and pieces of equipment on ISS. But now even that feels as if I never left, which is lucky as we had to start preparing difficult scientific experiments straight away. Serena and I also had a complicated onboard assignment to support two NASA colleagues during their spacewalk, right in our first week on board. For that assignment, we manually had to maneuver the massive ISS robotic arm, and also we had to help our colleagues Drew and Ricky into their spacesuits, performing the final check before they would leave the relative safety of ISS in order to work outside in open space. When putting on helmets, shoes and gloves, every little mistake can be fatal, since the environment in open space is not exactly life-friendly. Like a shepherd in a stormy night, I only relaxed again once my two colleagues were safely back inside. I am very much looking forward to the months ahead in this fantastic laboratory, with hundreds of unique scientific experiments that will make life on Earth better. Thanks to my experience I can now help my new colleagues settle in up here. But the learning phase is not over for me either. Because when you work inside the most complex machine of humankind, there is always something new to learn. Thanks for the inside. Love to read it! Keep on going, take care! Toll, dass ich durch diese tollen Berichte das Gefühl habe ich bin irgendwie mit dabei. Vielen Dank Alexander für diese doch sehr beeindruckenden Schilderungen der Mission. Ich denke täglich an die ISS und freue mich über alle Berichtetstattungen, Bilder und Impressionen. Alles erdenklich Gute für das ganze Team. Danke für diese Inneneinsichten. Wir schauen nach euch, wenn ihr sichtbar seid. Viel Spaß und gutes Gelingen bei eurer Arbeit. Wir hoffen auch weiterhin auf wundervolle, faszinierende Bilder und Einblicke auf Instagram oder Twitter. Ich habe schon als Kind von der Raumfahrt geträumt. Dank der phänomenalen Bilder, Videos, Experimente, Erklärungen darf ich ein bißchen weiterträumen. Danke!! Manche Filme sind zum weinen schön, ehrfurchtgebietend! Bin in Gedanken oft bei euch! Ich war bislang davon ausgegangen, dass zumindest Dinge wie die Soyus inzwischen so weit ausgereift sind, dass es nicht mehr Regelmäßig zu Fehlfunktionen kommt. Und hiermit sind meine dringendsten Fragen beantwortet. Vielen Dank! Das ist ein so interessanter Einblick in Ihre Arbeit. Ich freue mich das lesen zu dürfen. Ich wünsche Ihnen, dass alle Aufgaben und die ganze Mission ein Erfolg wird und freue mich auf den nächsten bzw. Weitere Blogeintrage. …endlich mal ein hochinteressanter Bericht, der anhand persönlicher Eindrücke einfühlsam verdeutlicht, was sich im Detail zwischen dem Start und den ersten Tagen auf der ISS an teils herausfordernden Erlebnissen abspielt: wirklich allerbeste Unterhaltung. Herzlichen Dank für diesen einzigartigen Eindruck! Vielen Dank für den Bericht. Heute Abend konnte ich die ISS sogar mit bloßem Auge und im lichtverschmutzen Berlin sehen. Ein phantastisches Gefühl. Cool, dass außer der Arbeit noch Zeit bleibt für solche Projekte wie mit Kraftwerk. Stark, die ISS mit bloßem Auge am 24.07. gegen 21:56 nahe Ramstein gesehen zu haben; und das mit unserem Alexander an Bord. Ich warte bis 23:30 um mir das nochmal anzuschauen. Winke mal Alexander! Auf einem Berg stehen, den Blutmond und den Mars beobachten, während die ISS mit ihrem sichtbaren Überflug dieses Ereignis krönt! Was will man mehr? Aber in diesem Fall muss ich versuchen etwas zu bewegen. Alexander, bitte rüttel die Menschen wach. Ich möchte die Abholzung des Regenwaldes stoppen, aber mich kennen nur ein paar Menschen und dich Millionen. Wie wird es meinem Sohn in 50 Jahren auf der Erde gehen? Ich hoffe, diese Nachricht geht nicht unter. When I was reading this I almost felt like i am traveling in space doing all those stuffs you did, surely one hell of an experience that was for you. danke für Eure Berichte! Damit sind wir ganz nah dran. Darum geht´s mir auch bei meiner Frage: Wie kann ich jemanden oder gar Alex selbst erreichen, in einer Anfrage für ein Foto aus dem All betreffend? Worum geht´s: Als weltweit größte Primatenschutzorganisation leistet BOS Deutschland e.V. mit seinen Partnern in aller Welt einen wertvollen Beitrag zum Schutz der Orang-Utans (die nur noch in geringer Zahl auf Borneo vorkommen), des Klimas und des Regenwalds. Anlässlich des Welt-Otang-Utan-Tags am 19. August stellen wir uns die Frage: Wie geht es dem indonesischen Regenwald und den Orang-Utans wirklich? Alex ist der einzige, der uns aktuell diese Frage beantworten kann: mit einem Foto aus dem All. Ist es möglich, trotz der eingeschränkten Zeit und all der Arbeit und Experimente, die an Bord durchgeführt werden müssen, solch ein Foto zu bekommen? Damit könnten wir gemeinsam der Öffentlichkeit zeigen, wie ernst die Situation für unsere nächsten Artverwandten und ihren Lebensraum, den Regenwald, darüber hinaus aber auch für das weltweite Klima ist. Wir würden uns über eine Antwort sehr freuen, auch wenn wir wissen, dass wir nicht die einzigen mit solch einem Anliegen sind. Brita von BOS Deutschland e.V. Herzlichen Glückwunsch Space Station Commander Alex!!!!! Hab euch gerade gesehen wie ihr zwischen den Wolken drübergehuscht seid. Danke für diese wundervolle Reise die ich mit euch machen durfte! Bis bald auf dem Mond!